Tiny Tiger Hirsh Guha tests for his belt promotion with an instructor on Thursday. Karate stresses obedience, control and respect. The “Tiny Tigers” program at the Lawrence American Tae-kwon-do Assn. Black Belt Academy, owned by Senior Master Steve Westbrook, aims to teach these ideals early on. On Thursday evening, levels one through three of the Tiny Tigers program took the first steps in fulfilling this mantra as they gathered for their belt promotions. There are 11 belt levels in all up to the Black Belt, and Thursday’s ceremony of the “Tiny Tigers” helps to push beginners on to their next level of belt and skill level. Dominique Jackson, a Tiny Tigers instructor, said the program is a good foundation for young karate participants to start with. In order to reach their next level of belt, the Tiny Tigers had to demonstrate courtesy through a series of movements. Students were also tested on their comprehension of ideas and skills taught in the class. The focus on was about goals and positive and negative attitudes. Students are taught to be respectful of these elements in their time in the class as well as in life in general. Six-year-old Joe Winebrenner participates in the lower- level Tiny Tigers class and said he likes talking about goals, because his biggest goal is to reach his Black Belt someday. “I really just like everything about karate though,” Winebrenner said. Winebrenner is on his third level of belt, a yellow belt, and must work his way up through camouflage, green, purple, blue, brown, red and rec black belts until he reaches his Black Belt. In the disciplined art of karate, reaching this goal could take years and a lot of patience. Meanwhile, though, the Tiny Tigers are content to have fun with their friends on the mat. The upper-level classes can even spar with the use of some custom padding and headgear. The program incorporates this sparring into its teaching of self- defense tactics. Another aspect of the belt promotion was also demonstrating to the teachers that the students were capable of protecting and defending themselves by getting out of a series of holds. Winebrenner said one of his most favorite things about Tiny Tigers is sparring. 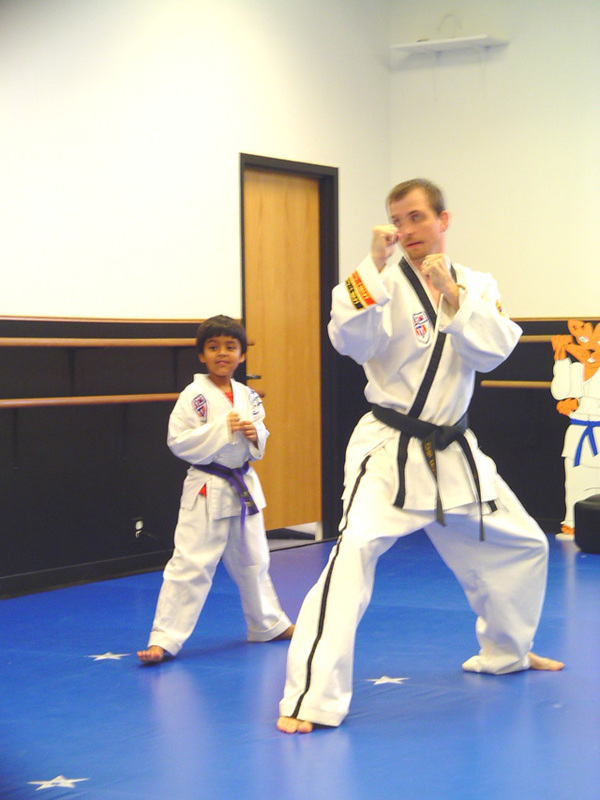 After making their way up through all the levels of the Tiny Tigers program, the students can advance to the Karate for Kids program, where they learn even more advanced techniques. A lot of that perseverance involves respect, on the mat for the students’ instructors, at home with their parents and at school with theirfriends. The road to a Black Belt is considered a long one, but the Tiny Tigers ensured they started off on the right foot.